Happy Friday! Straight to the links we go. From Julie: Right out of a zombie movie, a supposed corpse wakes up in a morgue and scares the bejeezus out of everyone. From Cassandra: a really fascinating half-male, half-female, split-colored butterfly has emerged from a cocoon. Also from Cassandra: Ad slogans throughout the years. Not from Cassandra, but for her so she can rant about this: Chick beer. (Ugh. Give me some Rogue's Dead Guy Ale or Celebrator, not this stuff supposedly targeted at women.) From the local blog Hoperatives, which is a great read and highly recommended. And, finally, Lughnasa is almost here; Carrickfergus Castle is an especially nice place to be at that time. So I'm told, anyway. Steampunk Librarian giveaway news: Sir Reginald is indisposed, but we stole his hat and drew names for the Falling Machine giveaway contest! Interested in supporting "musical architecture for New Orleans"? Consider contributing to the Dithyrambalina! Szoki makes fantastic poster images of popular characters from the sci-fi world. I think a whole series on a wall would look great. Have you imagined Grace Jones in LEGO form? This, and much more, can be found in Flickr's LEGO Album Covers gallery! Another great Flickr site is wishbook's collections of 1980s catalogs and vintage Disney material. Fun for flipping through with someone else, just like looking at the catalogs back then! Strange as it may sound, apparently there are as many newspapers today in the U.S. as there were around 1890, according to Stanford's visualization of newspaper publishing throughout the years. Meanwhile, libraries are expanding their horizons. MP3 checkouts, for instance! And lots of e-books! And even a library on a canal boat! Fellow grammar and spelling police, here is an article designed to cause teeth-gnashing; the word "literally" is being weakened through overuse. Literally! Hey, what's the weather like outside? Dangerous Heat. Feels like 110. Well, all right then. Back to the links. The wacky summer festivals continue! And finally, Cannes may be best known for its film festival, but they put on a nifty firework festival as well. It's especially interesting to look at the music choices for each entry. In the 1880s, the scorer for the Cubs baseball team was a woman! Unofficially, of course. But hooray for "E. G. Green," also known as Eliza, for her baseball career. Sunday Magazine continues to be a great source of retro news with articles about a millionaire planning to live on a yacht and attempts to invent levitation machines (both from 1911). Austin Peay State University has a steampunk class! I am envious. I am also envious of the people who live near London's Kew Bridge Steam Museum; their celebration of steampunk is going on right now and looks like all kinds of fun (tea duels?). And finally, as we (finally!) prepare to conduct the drawing for The Falling Machine, Ann and Jeff Vandermeer's The Thackery T. Lambshead Cabinet of Curiosities is out, and looks fantastic! Oy, it's Friday, and that is a very good thing! From Zazoo: behold the bookless library, inching toward us byte by byte. Not from Zazoo, but rather for him and Satori: a man is allowed to wear a colander on his head for a passport photo, thanks to Pastafarianism. Club Creature influence, perhaps? From Julie: a lost Michelangelo painting may have been found, and the British Library is out to save the St. Cuthbert Gospel for posterity. From Cassandra: biology gets philosophical, and freedom gets digital. From Bill Lucey's weblog: journalists who keep working, way past the typical retirement date. What to do this weekend? Why not storm the Bastille? Even if you're not in France, there are celebrations worldwide. My favorite is the super-soaker version at Pennsylvania's Eastern State Penitentiary. On the other side of the United States, Da Vinci Days are going on this weekend in Oregon! Meanwhile, England is celebrating the World Championship Snail Races on a cricket field (yes, really), and the World Santa Claus Congress is meeting in Denmark. Elves are there, too. Christmas is right around the corner, you know. From Julie: a book at a church sale in America turns out to be "a long-lost Byron memorial." What are the odds? From Bunny: a wacky and slightly disturbing hand puppet. From Cassandra: Guilt, forgiveness and "stolen suffering." And finally, from McSweeney's, something I sent around and posted on Facebook, and is still funny to me days later: What Your Favorite '80s Band Says About You. 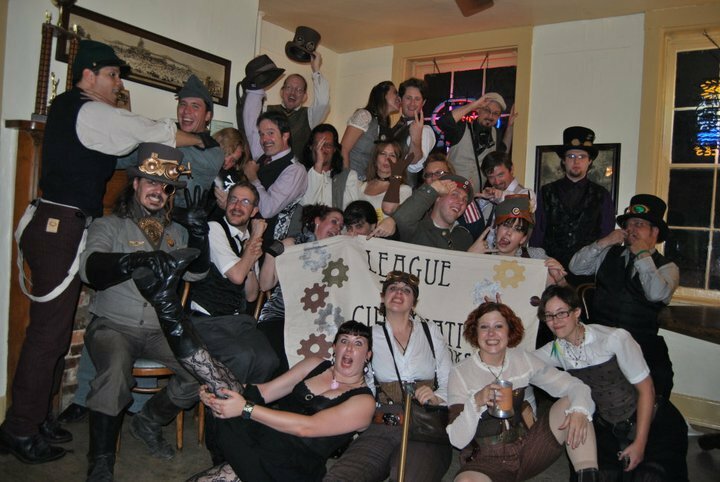 If you are not a member of a steampunk league/troop/squadron/gang/whathaveyou, look at all the fun you are missing! This photo, courtesy of Mr. W.B., is from last weekend's League of Cincinnati Steampunks salon. Meanwhile, over at the Steampunk Opera, they've done a lovely four-part series on the Golden Dawn. And finally, something which has no real connection to steampunk, but features two inventions of the 19th century: baseball teams as ice cream flavors. Ha! From Bunny: Behold, the incredible lyrebird. It can imitate motorcycles, garbage trucks, and pretty much anything else making noise in its environment. From Zazoo: The amazing piano theft! Also from Zazoo: Amazing optical origami. From Julie: Mysterious Mayan tombs! With tiny camera action! Also from Julie: The harshest author-on-author insults! I particularly like the Hemingway-Faulkner slapdowns and Mark Twain harshing on Jane Austen. Have a spiffy holiday weekend, everyone. See you next week.